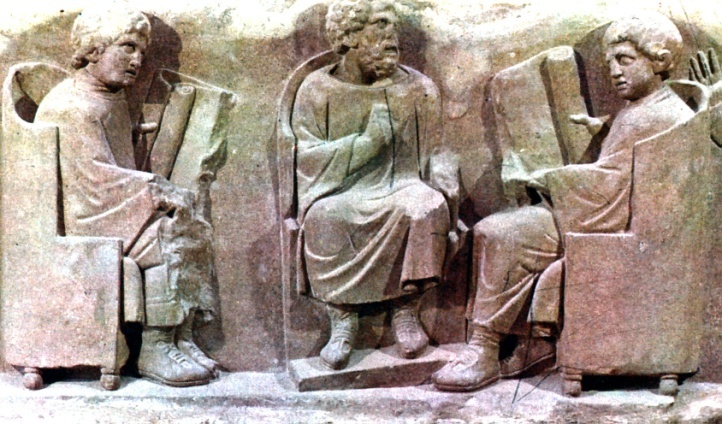 A sandstone relief from Gaul (now Neumagen in Germany) showing a teacher flanked by pupils, who read from papyrus scrolls. Third century. (Museum of Trier). Rubbing of tomb relief showing a master lecturing from a platform. Students of various ages sit on mats and read from strips or strips bound into a scroll. 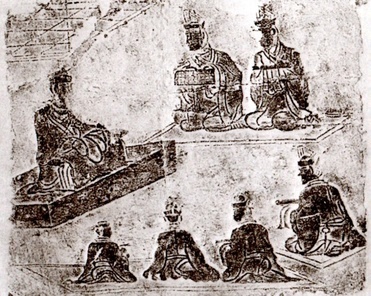 Latter Han Dynasty. (Chongqing Museum). The Chinese invented paper, but not until the Latter Han Dynasty did it become fined enough to write on easily. Before then, strips of wood or bamboo were the common writing material. Silk books existed, but were very expensive. 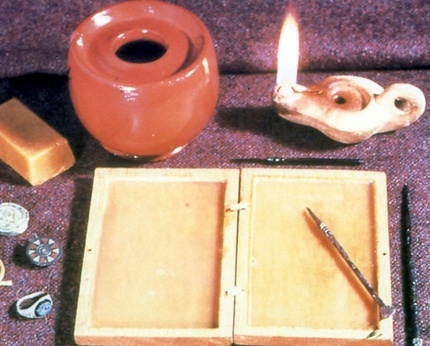 Romans generally used wax tablets; papyrus and parchment were expensive. The Chinese rub an ink stick with water on an ink slab to make ink when needed, and write with a brush. 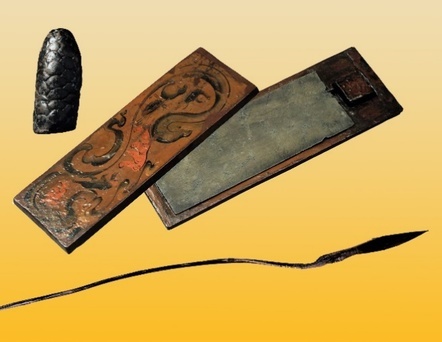 The slab with lacquer cover, shown above, is from Former Han Dynasty. The brush with rabbit hair is from the Warring-states period, preserved inside a bamboo tube. Rolls of papyrus were kept in round boxes to protect them from humidity. The left side shows excavated Qin laws written on bamboo strips, interred in 227 BEC. (Shihuangdi, Hubei). 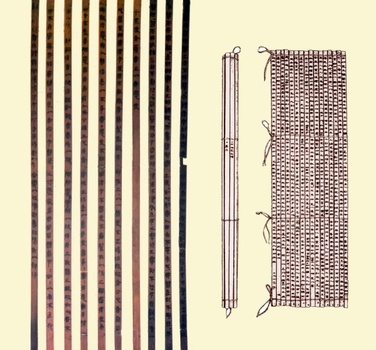 The drawings on the right side illustrate how the strips are tied together into a sheet and rolled up for storage. 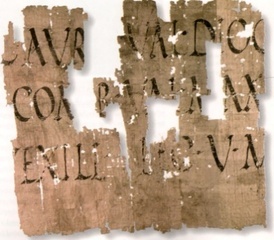 Part of a large public dedication to the emperor Diocletian and Maximian (285-305) on a fragment of papyrus. It and some 50,000 papyrus scraps fromOxyrhynchus in Egypt provide valuable information for historians, just as excavated Chinese bamboo strips do. 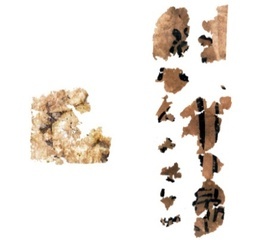 Left: Paper made with hemp in the Former Han Dynasty, excavated in Shaanxi, is too coarse for writing. 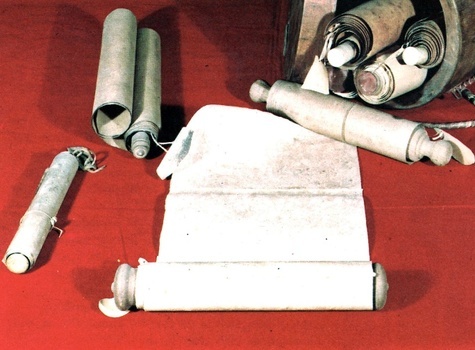 Right: In the Latter Han (25-220 CE), inexpensive fine grade paper made of plant fiber became available. The scraps shown are excavated in Wuwei, Gansu.